The first vertical milling machine was developed in the 1930’s as the Bridgeport style vertical miller. 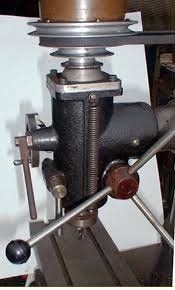 This Bridgeport style miller is also known as a knee miller or turret mill. Horizontal millers were created much earlier; first introduced around 1818. The new vertical design placed more importance on versatility and economy over higher speed metal removal rates offered by horizontal milling machines. This versatility has made vertical millers the most prevalent design of milling machine in existence today. Horizontal millers are typically reserved for milling operations where duplicate parts are being created and when high metal removal rates are required. Vertical type millers offer many advantages over the older horizontal style milling machines. First, it’s important to understand the features that distinguish a vertical miller from the rest. Sliding arm or rams, which allow movement of the work piece toward and away from the vertical column. Knee and column support for the machine work table, which enables vertical movement of the workpiece in relation to the milling tool. The spindle, motor and drive pulleys are held by a one piece tool head. Saddle designed to support the work table and to enable movement of the workpiece toward and away from the vertical column. Some milling machines offer the ability for the tool head to be tilted front to back or side to side. An important advantage of the mechanical vertical miller is the retractable quill, which moves in and away from the cutting tool without need for cranking the work table up and down. This increases productivity and milling efficiency by reducing operator fatigue. Movement of the work table is still possible for making adjustments, however. The next advantage is the vertical machine’s ability to easily make angle cuts. Horizontal milling machinery must either have the spindle made at an angle or the work piece must be positioned at the appropriate angle. Vertical millers have an adjustable table that can simply be tilted by the operator to cut at any angle. Vertical millers are much simpler in design than horizontal machines. The one piece cutting tool eliminates the need for additional gearing inside the vertical column. The main advantage of the horizontal type miller is that they are much more rigid and can use cutting tools which remove more metal in less time. Vertical machines must use smaller tools which can accomplish the same results, but at a slower rate of speed. These smaller tools do, however offer more precise cuts, which is advantageous for production of small or intricate parts. A horizontal miller can quickly and efficiently create duplicate parts and parts that require the removal of a lot of material. In this way, horizontal milling machines are more cost effective to use than milling with vertical machine tools. For this reason, horizontal millers are commonly used to mill large automotive components. Newer milling machines are integrated with CNC or computer numerical controls making both styles of millers much more efficient and precise. The main differences are still the same, which is why vertical milling machines are used for their versatility and precise milling applications. Horizontal millers are commonly used for milling of large parts and duplicate part milling applications.